Lucky are those who can live their life to the fullest without much restriction. As for the rest of us who suffer from certain types of medical conditions that hinder us from performing strenuous activities with ease, everything that we do is done under the watchful eyes of our parents, guardians, and doctors. You may also see work action plan examples. You probably know someone who was always exempted from P.E. classes due to asthma. As much as you envy the perks that come with this condition, having a pair of imperfect lungs isn’t exactly a privilege rather, it’s a limitation that many people would rather live without. You may also like career action plan examples. Having asthma is a lot more complicated than the inability to climb up a flight of stairs without any resting time in between. Though some conditions may not be as severe as others, not many people know how to respond when someone around them is experiencing an asthma attack. During moments like this, something as useful as an asthma action plan can come in handy. Unlike common allergies, you don’t always have full control of your asthma. Some triggers are nearly impossible to avoid, especially when it involves everyday factors. This is why many doctors suggest that individuals with the chronic lung disease should start carrying simple action plans to educate parents, guardians, or even complete strangers about the disability and how to react to it. 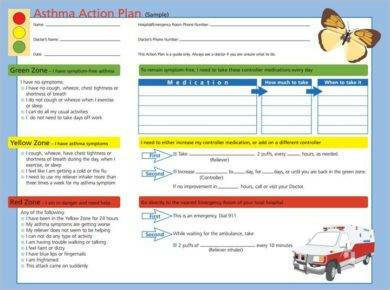 An asthma action plan is a written document that teaches people how to control one’s asthma during emergency situations. These documents are typically aimed toward children who may have trouble managing their conditions. The primary goal of the action plan is to reduce or prevent cases that involve flare-ups and emergency department visits. 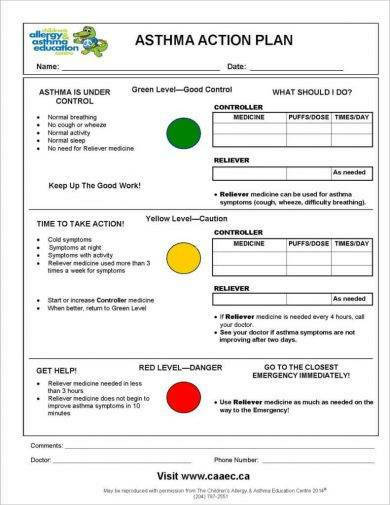 This will also help carers and/or the person with asthma take early action to prevent the severity of an asthma attack. The plan may be designed based on the symptoms exhibited by the individual, along with the pattern of one’s asthma. Among children, symptom-based action plans are more preferred. 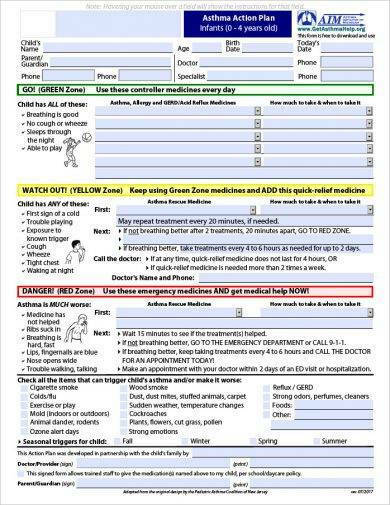 A written action plan is one of the most effective asthma interventions available. It offers many benefits for parents and their children. This can help reduce absences from work or school, minimize the likelihood of hospital visits or admissions, lessen the need for reliever medication, and improve the way one’s lungs function. You may also see sales action plan examples. 1. What Is in the Plan? Each person’s asthma is different. This is why doctors and carers typically create personalized action plans that best suit the subject’s condition. Other essential details to include is the date for when the plan was written, the patient’s name, as well as the doctor’s contact information to make it easier for a carer to communicate with the doctor in case they have any further questions or concerns that need to be addressed. You may also like marketing action plan examples. The last thing you’d want to do is panic in front of the person suffering from the attack. Panicking only adds more stress into the situation, making it difficult for the subject (the person with the asthma) to remain as stable as possible. You wouldn’t want to jump into conclusions and cause an alarm by calling an ambulance when there isn’t a need to do so, either. You may also check out business action plan examples. Ensure that the action plan fits their treatment regimen, asthma severity, culture, language, literacy level, and ability to self-manage as well. 2. How Do I Read the Plan? 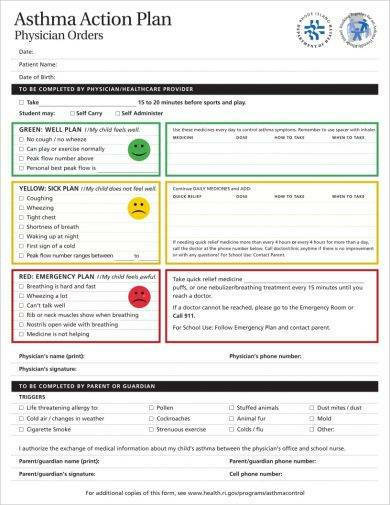 Many asthma action plans are user-friendly. 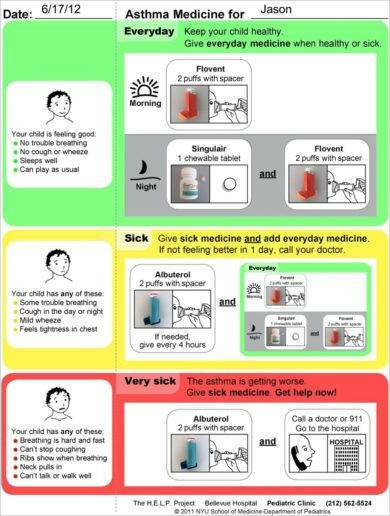 So instead of using plain words, they use pictograms or a color-coded system to help parents or carers understand each stage of their child’s asthma. 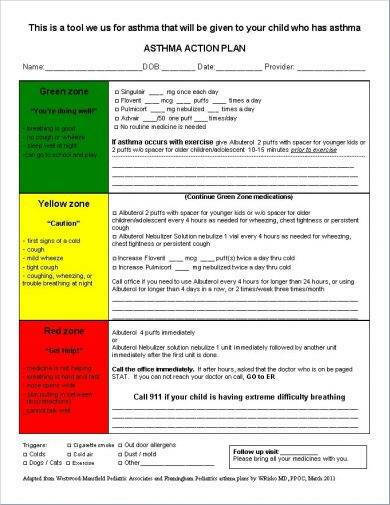 The “zone system,” which is inspired by the red, yellow, and green colors of a traffic light, uses the symptoms and/or peak flow readings to determine what “zone” your child is in. You might be interested in team action plan examples. 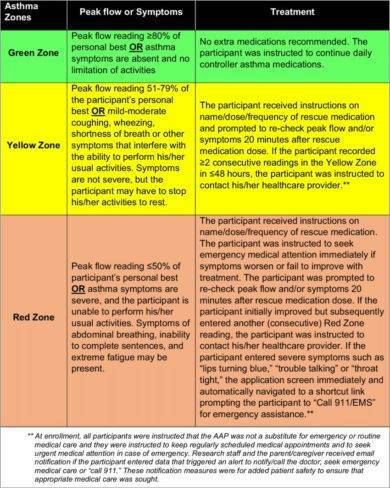 The green zone is also known as the safety zone. It explains how you could care for the child when they’re feeling good by avoiding possible triggers that may stimulate an asthma attack. The yellow zone is the caution zone. It describes how to look for any signs that may indicate that the asthma is getting worse. This is the part where the subject must slow down and follow the steps written in the plan. 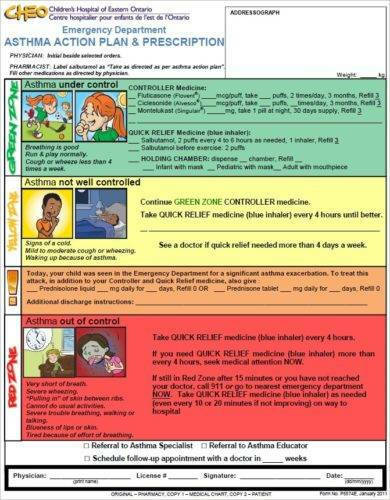 It also tells readers which medicines to add, such as quick-relief medicines, to help bring the child’s asthma back under control. You may also see project action plan examples. The red zone, or the danger zone, is the most alarming stage to reach. It elaborates what you can do in the event of a severe flare-up. It’s possible for the attack to worsen even after a few minutes of the first symptom, which is why it’s important to act quickly and efficiently before it’s too late. It’s also essential to familiarize what is written in the general plan to save time. You can also ask your doctor for further advice if you have any questions that need to be clarified. 3. What Do I Need to Know? Since the action plan is meant to assist your child and the people around him or her about how to respond when an asthma attack happens, you need to make sure the plan goes wherever your child goes. You can also keep a copy of the plan in a well-known spot at home, give a copy to the school, or provide one for teachers or anyone else who cares for your child. Be sure to discuss the content of the action plan to them so they’ll be comfortable following it. You may also like employee action plan examples. Additionally, meet up with your doctor at least every six months to review the plan. Ensure that it stays current at all times, as possible changes, such as a change in medicine dosage, may affect the outcome of the treatment. You may also check out budget action plan examples. There are many reasons why you should have an action plan in place. The plan simply shows your daily treatment, such as the kind of medicines you take and when they must be taken. It also explains how you could control long-term asthma, as well as instructions on how you could handle worsening asthma or asthma attacks. You may also see sales action plan examples. If none of the treatments are working or if the asthma is getting difficult to control, you could either call a doctor or take the patient to the emergency room, depending on the situation at hand. Besides the parents of the child, caregivers including babysitters, nannies, teachers, and daycare workers should be aware of the child’s condition. Since not everyone knows how to treat asthma, you can use the action plan for proper guidance. This will help you stay on top of the symptoms when they first appear, lessening the chance for the asthma to get in the way of your daily life. You may also like research action plan examples. If you have asthma, it’s a good idea to consult with your healthcare provider to create an action plan containing instructions for early treatment of your symptoms. 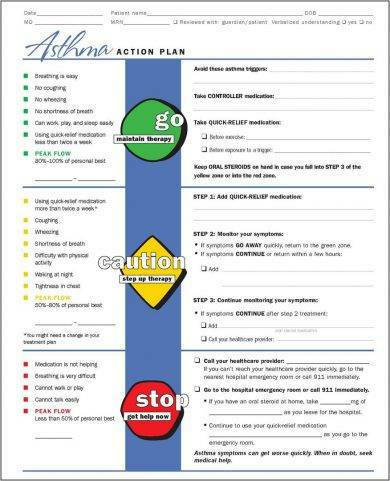 An individualized asthma action plan indicates the steps that must be taken to keep your asthma from getting worse. You may also see strategic action plan examples. 1. Provide general information that readers should know about. Since every asthma case differs, it’s best to work with your doctor when writing the plan. The asthma action plan must consist of key information that caregivers (or yourself) should know about. You may also like personal plan examples. This includes the factors that can worsen the asthma (aka asthma triggers), specific medicine names that must be taken to treat the asthma, symptoms or peak flow measurements (if used) which indicate worsening asthma, other medicines or relievers to take based on certain signs or symptoms, symptoms or peak flow measurements (if used) which indicate the need for immediate medical attention, and telephone or mobile numbers for emergency contact, along with that of your doctor and your local hospital. 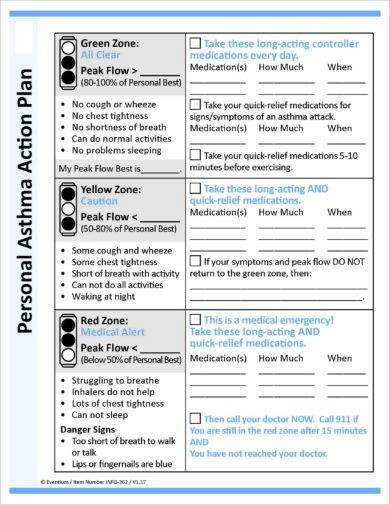 Since we’ve already discussed how action plans with “asthma zones” are read, let’s focus on how asthma action plans based on peak flow rate or asthma symptoms are used. For individuals with moderate to severe conditions, your healthcare provider may opt to use peak flow monitoring to manage your asthma. A peak flow rate may show if your asthma is getting worse, even before the symptoms are felt. This is measured through a device called the peak flow meter. 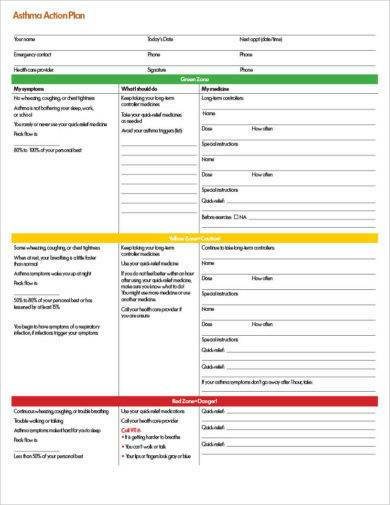 You may also check out restaurant action plan examples. To use your peak flow rate in determining each zone on the action plan, you must first take the time to identify your personal best. This is the highest peak flow number obtained in a two- to three-week time period. Once this has been determined, your healthcare provider can use your personal best peak flow rate to calculate each zone of your asthma action plan. You might be interested in 90-day action plan examples. Another way to manage your asthma is by tracking your symptoms. Some of the most common asthma symptoms that indicate that there is a problem include the following daytime symptoms (coughing, wheezing, or tightening of the chest), problems with activity level (when playing, exercising, or working), and possible nighttime symptoms such as difficulty in breathing. You may also see community action plan examples. 3. Identify what to do during certain situations. 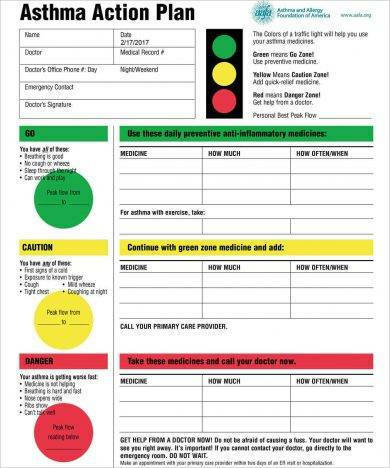 Similar to an allergy action plan, there are specific medicines and relievers that may be taken while you’re still in the green or yellow zone of the chart. In case you aren’t feeling well, the plan carries instructions on what to do when the initial symptoms appear and how to react when the asthma takes a turn for the worse. The name of the medicine, how to take it, and when to take it must also be indicated clearly in the plan. Keep in mind that the dose and frequency may vary depending on the severity of the asthma. Long-term control medicines – These are maintenance or anti-inflammatory medicines that help prevent common asthma symptoms by managing the swelling in your lungs and decreasing the production of mucus. Though they may work slowly, they can help control your asthma for a couple of hours. They should also be taken regularly—despite the absence of any asthma symptom—in order to work. You may also see printable work action plan examples. Quick-relief medicines – Sometimes referred to as rescue medicines, these help relieve or stop asthma symptoms once they are felt. They usually come in liquid form where they are inhaled through an asthma inhaler to quickly relax the muscles that tighten around your airways. When this happens, your airways open up and make it easier to breathe. It’s also advisable to use quick-relief medicines before you exercise to prepare your body for what’s to come. You may also like business action plan examples. 4. Specify what to do in emergency cases. The red zone is the most critical stage of the action plan. It consists of steps you need to take in case of an emergency. It includes the emergency contact numbers for the doctor, the hospital, and friends or family for support. Simply put, an asthma action plan provides the person with asthma and/or their carer clear instructions on what to do when symptoms of asthma appear. By following the steps written in the general action plan, you can help your child perform normal, day-to-day activities without experiencing alarming episodes or symptoms of asthma.